Immunoglobulin E (IgE) is an antibody associated with hypersensitivity and allergic reactions. IgE mainly binds on the high-affinity IgE receptor (FcεRI) on mast cells and basophils. Upon FcεRI cross-linking following allergen exposure, inflammatory mediators including histamine, leukotrienes and pro-inflammatory cytokines are released . However, in murine models, the binding of IgE itself on mast cell surface may already favour cell survival and cytokine release irrespective of the presence of any allergen [2, 3]. Although direct evidence for this is still lacking in humans, it has been reported that asthmatics with high sputum IgE levels have also raised sputum levels of TNFα and Interleukin-6, two cytokines released from mast cells . Therefore, IgE might possibly be considered as an inflammatory mediator independent of atopic status and deserves to be monitored. In a study of a community population with measurements at two time points over an 8-year period, the level of serum total IgE (sIgEtot) tended to be stable in subjects above the age of 35 years while levels decreased in children and young adults. Atopic subjects tended to show a decrease with age even after the age of 35 years . Further, a longitudinal study spanning a period of up to 20 years also showed that smoking opposed the natural decline in IgE and synergized with atopy to result in increased levels in subjects over the age of 50 years . However, variation in sIgEtot beyond two or three time points in the same subject has not been studied extensively. Omalizumab, a monoclonal antibody that binds serum IgE, has become part of asthma treatment for the severe spectrum of the disease in which patients remain uncontrolled despite a combination of high dose inhaled corticosteroids (ICS) with long-acting β2 agonist (LABA). The drug has been validated in asthmatics whose serum IgE ranges from 30 to 700 IU/mL but most of the effect in terms of reduction of exacerbation was confined to patients with serum IgE ranging from 76 to 700 IU/mL . A retrospective chart review of severe asthmatics with two to four measurements of sIgEtot over an average period of 2 years showed some clinically significant variability in sIgEtot affecting candidacy and dosing of omalizumab . A recent prospective study conducted with 17 moderate-to-severe asthma patients with 6 serial measurements confirmed this variability in sIgEtot over 1 year . To better understand sIgEtot variation and factors influencing this variation, we conducted a 12-month prospective study of sIgEtot levels in severe asthmatics treated with high-dose ICS and LABA. Furthermore, we also examined how fluctuation in IgE may relate to day-to-day environmental exposure, asthma control and exacerbations. Patients enrolled in the study had an established diagnosis of severe asthma as defined by the ERS/ATS consensus statement , aged ≥ 18 years, and currently treated with high-dose ICS (daily dose of fluticasone propionate > 500 µg or equivalent) and a LABA. Patients were excluded from the study if: (i) they were being or had been treated with omalizumab (Xolair®, Novartis, Basel, Switzerland), unless treatment was stopped at least 1 year before inclusion; (ii) they were undergoing immunotherapy; and/or (iii) used an investigational drug at the time of enrollment or within 30 days prior to enrollment in the study. This was a prospective, multicenter study to assess variability of sIgEtot levels in severe asthmatics conducted in 5 Belgian centers. The 12-month variability in sIgEtot levels in the total population was assessed and the proportion of the total variability explained by within- and between-patient variability was calculated (primary objective). In accordance with reimbursement criteria in Belgium, patients were stratified post hoc into three groups on the basis of baseline sIgEtot: < 76 IU/mL (low IgE), 76–700 IU/mL (intermediate IgE), and > 700 IU/mL (high IgE). These three groups were selected based on the study of Bousquet et al., which demonstrated that omalizumab reduces the annualized rate of asthma exacerbations more in patients with sIgEtot ≥ 76 IU/mL ; and based on the upper limit of serum IgE inclusion criteria of the INNOVATE registration study (< 700 IU/mL) . These two studies are currently used as the basis for the reimbursement of omalizumab in Belgium. An additional objective of the study was to evaluate demographic, environmental, and treatment factors that may influence sIgEtot variation and whether sIgEtot relates to asthma control and asthma exacerbation. At baseline patients completed the six-item Juniper Asthma Control Questionnaire (ACQ6) ; blood was sampled to measure sIgEtot levels; and atopic status of the patient was evaluated with a radio allergosorbent test (RAST) directed towards common allergens: grass mix, birch, mould mix, house dust mite (Dermatophagoides pteronyssinus), and cat and dog dander. Patients were considered atopic if RAST levels to any allergen exceeded 0.35 kU/L. Additionally, an environmental questionnaire was completed which enquired about the frequency of patients’ exposure (1: “once, more than 1 month ago”; 2: “once, more than 1 week ago”; 3: “once, within the last week”; 4: “occasionally”; 5: “frequently” or 6: “constantly”) to house dusts, pollens, molds, cats and dogs, smoke, humidifier/vaporizer, and carpeting. Subsequently, 6 visits were planned every 2 months for a follow-up period of 12 months. At each visit, sIgEtot was measured, the ACQ6 and environmental questionnaires were completed, and the treatment prescribed by the physician was registered. Treatment prescription, continuation, or discontinuation was per the physician’s best clinical judgment and in accordance with the Belgian reimbursement criteria. Also, to allow for the monitoring of exacerbations during the study, patients had to report if and how many times they had an exacerbation since the last visit. The presence of an exacerbation in the week preceding the visit was recorded specifically. A severe exacerbation was defined as an exacerbation requiring a treatment containing systemic corticosteroids for at least three consecutive days and/or an emergency room visit and/or a hospitalization. This study was approved by the ethical committee of the CHU Liege under approval number B70720096731. All patients had to provide an informed consent before entering the study. Descriptive statistics were calculated using frequencies, percentages, means, standard deviations, medians and ranges as appropriate. Comparisons in baseline characteristics between the three subgroups (low, intermediate, high sIgEtot) were tested using ANOVA with Tukey post hoc test comparison for age and a general linear model with contrasts for other (categorical) variables. Random-intercepts regression analysis was used to model log-transformed sIgEtot, with ‘patient’ as the random variable. The model allowed us to calculate intra-cluster correlations to determine how much of the variability observed in sIgEtot levels over time could be attributed to variability between individual patients, compared to variability within each patient. It also allowed us to test predictors of sIgEtot (exposure to allergens, active/passive exposure to tobacco smoke, change in asthma treatment, treatment with maintenance systemic corticosteroids, and ACQ6 score). Modeling of exacerbations (absent/present) was performed by logistic regression analysis, using generalized estimating equations to account for repeated measurements over time. This analysis was used to assess influence of treatment changes and time of year. 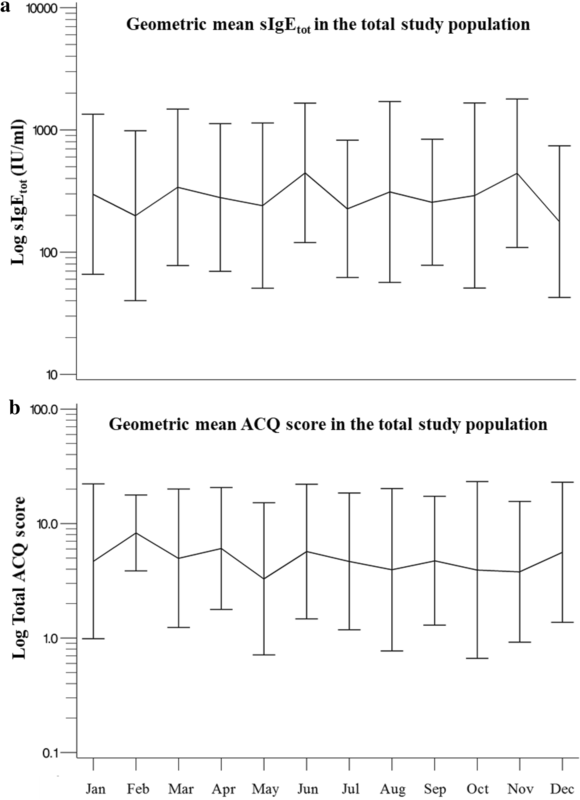 The correlation between sIgEtot and ACQ6 score at baseline was evaluated with a Spearman correlation. As this was a real-life study, data were collected from routine clinical practice and there may be missing data. Missing values were not imputed in the descriptive and statistical analyses. p values < 0.05 were considered statistically significant. In total, 41 patients were recruited. The median sIgEtot level at baseline in the entire study group was 248 IU/mL (range 17–7620 IU/mL). Mean ACQ6 score was 1.5 ± 0.87. Only 14/39 patients (35%; 2 responses unknown) had asthma GINA-defined as controlled at baseline. Of these 41 patients, 10 (27%) were included in the low sIgEtot subgroup (≤ 76 IU/mL; median baseline sIgEtot = 43.5 IU/mL, range 17–71 IU/mL); 20 patients (49%) were included in the intermediate sIgEtot subgroup (76–700 IU/mL; median baseline sIgEtot level = 247.0 IU/mL (range 86–667 IU/mL); and 11 patients (24%) were included in the high sIgEtot subgroup (> 700 IU/mL; median baseline sIgEtot level = 1332.0 IU/mL, range 729–7620 IU/mL). Atopy, defined as a positive RAST to at least one common aeroallergen, was present in 33/41 subjects (80%). The baseline characteristics by subgroup are given in Table 1. The between-patient variability represented 93.4% of the total variability for the entire sample, and 96%, 71% and 96% in the low, intermediate, and high sIgEtot subgroups, respectively. Therefore, within-patient variability represented 4%, 29% and 4% of the total variability in the low, intermediate and high sIgEtot subgroups, respectively. The within-patient variability was significantly higher in the intermediate sIgEtot group than in the other groups (p < 0.0001) (Table 2). Detailed individual trajectories over time by baseline IgE strata are shown in Fig. 1, panels a, c, and d. Ten of the 41 patients (24%) reached values beyond the limit of their own baseline sIgEtot subgroup during at least one of the follow-up visits. Of these 10 patients, 4 were in the low, 4 in the intermediate, and 2 in the high sIgEtot subgroup, therefore representing 40% of the patients in the low sIgEtot subgroup, 20% of the patients in the intermediate sIgEtot subgroup and 18% of the patients in the high sIgEtot, respectively. Two patients had sIgEtot levels in the three categories over the 1 year period of observation. 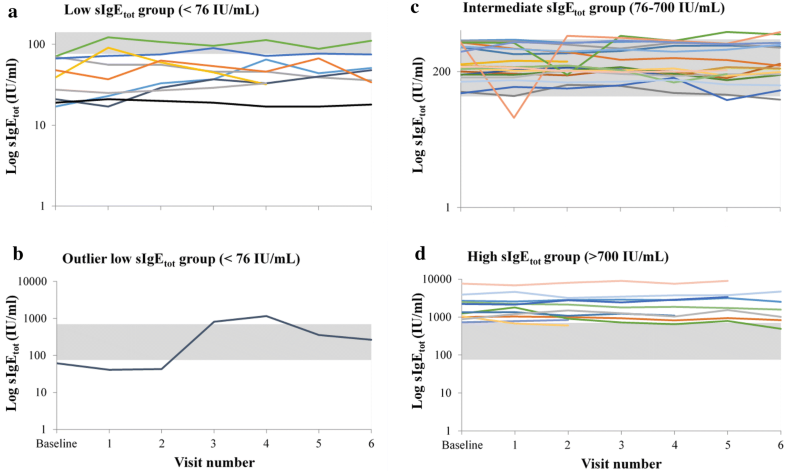 One patient initially in the low sIgE group had a rise in IgE above 700 IU/mL for at least 2 consecutive measurements before returning to intermediate levels at the two last visits (Fig. 1b). This patient was subsequently found to have developed a parasitic infection. The relevant clinical data for this patient are presented in Table 3. The patient did not have any positive RAST results at baseline and was therefore considered non-atopic. Age was a significant predictor of sIgEtot levels over 12 months. sIgEtot decreased by 3% with each additional year of age (p = 0.01). Allergen exposure for patients with a history of a positive RAST test was associated with change in sIgEtot. Exposure scores ranged from 0 to 12 and reflected the sum of the frequencies of exposure for the different allergens for which the patient had shown a positive RAST. A unit increase in the exposure score was associated with a 5% rise sIgEtot (p = 0.002). No relationship was found between sIgEtot and gender, smoke exposure, and asthma treatment. There was no relationship between lung function (% predicted FEV1) and sIgEtot variation at baseline or throughout the study period. The odds of severe asthma exacerbations the year prior to enrollment were not correlated significantly with baseline sIgEtot in the total study group (OR = 0.95; p = 0.21), nor in the low (OR = 0.85; p = 0.95), intermediate (OR = 0.82; p = 0.42) or high subgroup (OR = 0.96; p = 0.31). Over the entire study period, there was no correlation between sIgEtot and severe exacerbations since the previous visit nor with exacerbation that occurred the week before the visits. At baseline there was no relationship between sIgE and ACQ6 in the whole group (Spearman’s ρ = 0.01, p = 0.96) nor in any of the three groups. There was a significant but weak correlation between sIgEtot and ACQ6 score across all time points (r = 0.15, p = 0.02). Figure 2 shows the variation in sIgEtot (panel a) and asthma control (panel b) according to the seasons. In the total study group, there was no association between seasons (March–May, June–August; September–November; December–February) and sIgEtot (p = 0.47) or ACQ6 score (p = 0.43). There are limited data in the literature on the stability of IgE measurements over time in asthmatics. In the current study, we investigated variations in sIgEtot in severe asthmatics over a 1 year period with repeated measurements every 2 months. The principal finding is that most of the variability sIgEtot was due to between-patient variability whereas within-patient variability of sIgEtot levels was rather limited. sIgEtot was found to decrease with age. The relative stability in sIgEtot suggests that the mechanisms regulating IgE levels are sustained over time in most patients. Nonetheless, 24% of patients showed sIgEtot level scores beyond the range of their own group for at least one visit. This was particularly the case in patients with baseline sIgEtot < 76 IU/mL as 4 out of 10 patients had a measurement above 76 IU/mL in at least one subsequent blood sample. Omalizumab is a biologic with proven efficacy to improve asthma quality of life and reduce asthma exacerbations in severe allergic asthmatics. The findings from our study suggest that regular monitoring of sIgEtot in routine clinical practice may assist in optimizing treatment by aligning it with observed variations in sIgEtot and thus avoid under-treatment with omalizumab. As the 40% of patients with sIgEtot < 76 IU/mL at baseline but subsequent serum levels in the 76–700 IU/mL range underscore, without repeated blood sampling these patients might not have been initiated on omalizumab, which may have translated into a subsequent preventable need for corticosteroid therapy or into preventable exacerbations and hospitalizations. Likewise, the 20% of patients with sIgEtot between 700 and 1000 IU/mL who subsequently showed serum levels below the 700 IU/mL threshold might not have been initiated on omalizumab without repeated testing. However, patients with very high serum IgE levels (> 2000 IU/mL) remain fairly stable in this “high” zone. Although between-patient variability was the major trend identified in our study, limited within-patient variability was still present. Therefore, regular monitoring of sIgE over 1 year results in an increase from 50 to 66% of patients falling into the range between 76 and 700 IU/mL. The limited patient variability resulted in the fact that two-third (27/41) of our patients treated with high doses ICS/LABA had a serum IgE values between 76 and 700 IU/mL after a 1 year period of observation (including 7 measurements for most of them), a figure clearly higher than 50% of patients as observed at baseline. Despite the limited within–patient variability, one patient with baseline sIgEtot < 76 IU/mL showed significant changes in serum levels over the observation period. This patient who was non-atopic, maintained low IgE levels (< 76 IU/mL) at the first two visits, after which there was a marked increase to 818 IU/mL at the third and 1159 IU/mL at the fourth visit, before declining at subsequent visits without, however, returning to low serum levels. This patient was a severe corticosteroid-dependent asthmatic in whom a parasitic infection was detected and treated accordingly. Remarkably, when the sIgEtot increased sharply at visit 3, the patient’s ACQ6 scores rose from 2.3 to 4.2 without any change in FEV1 but with an augmentation of the OCS dose as treatment adjustment. This case points at the importance of considering possible etiologies when a sharp rise in IgE is detected. IgE levels are known to increase in the case of parasitic infection, namely helminth infections ; yet other causes of elevated IgE outside an atopic status should also be considered including infections by mycobacterium tuberculosis, Epstein–Barr virus, cytomegalovirus, malignancies, or chronic inflammatory/dysimmune disorders . Though not powered for that purpose, our study also showed an inverse relationship between age and serum IgE, a finding we have recently reported in a large cross-sectional study in asthmatics  and which was previously established in longitudinal population studies [5, 6]. A decrease in sIgEtot by 3% with every year increase in age was observed in the present study. Not unexpectedly, allergen exposure score was associated with a rise of sIgEtot in sensitized subjects, supporting a role for allergen exposure in IgE synthesis in addition to its role in mast cell activation thereby confirming a recent study . In contrast to what is known for eosinophils [16, 17], there are limited data on the relationship between sIgEtot and asthma control and severity. A higher sIgEtot level in severe asthmatics as compared to that in mild to moderate asthmatics has recently been reported in a large real-life cross-sectional study even if there was a considerable overlap between the groups . In the same study, there was however no correlation between ACQ7 and serum IgE. In the study reported here, though not present at baseline, a weak but significant correlation was observed between sIgEtot and ACQ6 score throughout the study period, which suggests that fluctuation in IgE over time in a subject may relate to day-to-day asthma symptoms. By contrast, no relationship was found between sIgEtot and severe exacerbation rates. Recent data from SARP (Severe Asthma Research Program) have shown an inverse and surprising relationship between serum IgE and propensity to severe exacerbation in asthmatics . Omalizumab convincingly reduces asthma exacerbation in clinical trial and routine practice in patients with serum IgE ranging from 30 to 700 IU/mL. The efficacy of omalizumab was shown when free circulating IgE was reduced by more than 95% and maintained at lower than 30 IU/mL ; however, sIgEtot itself prior to treatment initiation does not predict the ability of the drug to prevent exacerbation . Rather than considering the baseline IgE level, the IgE level at which omalizumab is able to maintain free circulating IgE may be more relevant in terms of reduction in exacerbations. It is also likely that airway (and not serum) IgE, which can be assessed in sputum [4, 21] and bronchial biopsies [22, 23], plays a more important role in the disease than circulating IgE though a convincing correlation was reported between serum and sputum IgE levels . We might have found a stronger relationship between IgE and exacerbation if we had measured airway IgE rather than serum IgE in the present study. The main limitation of our study is the limited number of patients included and followed up throughout the protocol. This may have resulted in a lack of association between sIgE and seasons in contrast to what was reported by others . Moreover, we did not found a relationship between smoke exposure and serum IgE. Our negative finding does not preclude, however, any real effect of smoke exposure on serum IgE because of the limited number of current smoking asthmatics in our cohort. Future studies with larger sample sizes are needed to confirm our findings and explore associations with other possible determinants of IgE variation. Asthmatics in this study were selected on the basis of disease severity defined by the requirement of high-dose ICS combined with a LABA. Therefore, the IgE variability depicted here may not be applicable to a population of mild untreated asthmatics. As we did not have detailed history data regarding atopic dermatitis we could not assess the influence of the disease evolution on sIgEtot over the study period; specifically, whether change in atopic dermatitis severity may have influenced change in serum IgE in our study. In our study the majority of patients with atopic dermatitis were in the intermediate IgE group. We conclude that in severe asthmatics receiving high-dose ICS combined with a LABA, there was limited within-patient variability of sIgEtot but significant between-patient variability. Yet 30% of the patients not initially eligible for receiving omalizumab based on a single measurement may actually benefit from repeated measurements to qualify for treatment. SG and SV designed the study. IA and KD wrote the protocol and performed the analyzes. JVS reviewed the protocol. GB, RL, AM, OM and CP collected the data. IA, KD, SG, RL, CP and AP interpreted the data. RL and AP wrote the manuscript. All authors read and approved the final manuscript. GB, RL, AM, OM and CP are members of an Advisory Board of Novartis Pharma, Belgium. IA and KD work for Matrix45, LLC. By company policy employees are prohibited from owning equity in or perform services independently for sponsor organizations. Matrix45 provides similar services to other biopharmaceutical on a non-exclusivity basis. SG, AP, JVS and SV are employees of Novartis Pharma, Belgium. This study was funded by Novartis Pharma, Belgium.